I had planned to visit the exhibit "Christian Dior", currently on view at the Royal Ontario Museum in Toronto, in mid-January, but my plans were derailed by the flu. I was finally able to go on a Friday in February, and there is nothing better on a cold and snowy day than being inside, looking at pretty things. Christian Dior was born in 1905 in a small town in the north of France. His father was a wealthy businessman and moved the family to Paris when Dior was five years old. There Dior developed a passion for art, and as a young boy sold fashion sketches to people on the street for extra pocket money. Dior wanted to be an architect, but his father wanted him to become a diplomat, so he studied Political Science. 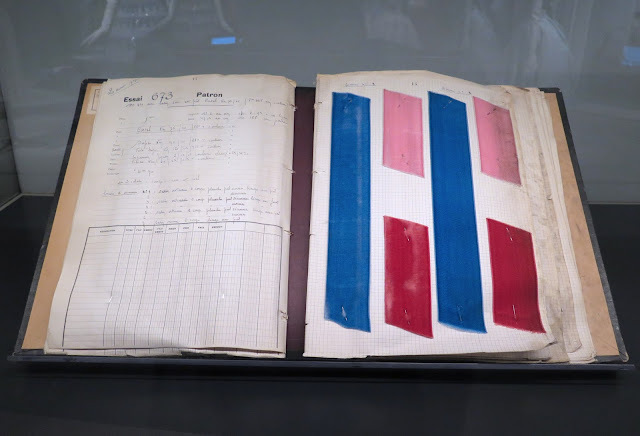 After he graduated from university, his father provided the funds for Dior to open a small art gallery in 1928, which he was forced to close in 1931 after the collapse of his father's business. He found work with fashion designer Robert Piguet until he was called into the military in 1940. After two years of military service Dior returned to Paris to work with couturier Lucien LeLong. In 1946, he opened the House of Dior, although 1947, when he showed his first collection, is considered to be the official founding date. 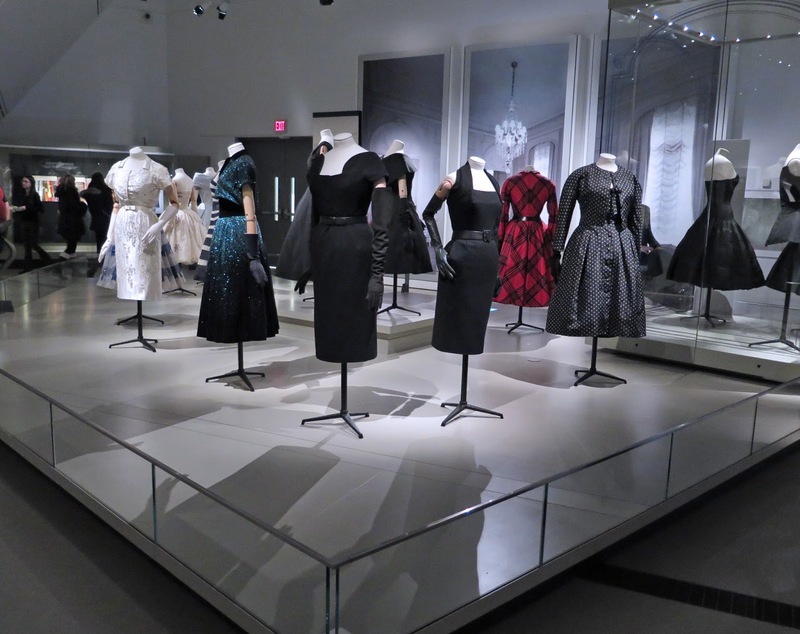 The exhibit, sponsored by Holt Renfrew, marks the 70th Anniversary of the founding of the House of Dior in Paris. The focus is on the decade of 1947 - 1957, when Dior debuted his first collection, which Harper's Bazaar called "The New Look". 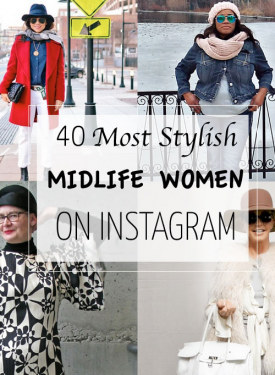 The Second World War had ended, and the practical, utilitarian style of clothing women had been wearing was replaced with soft shoulders, full skirts that emphasized tiny waists, luxurious fabrics, and beautiful embellishments. 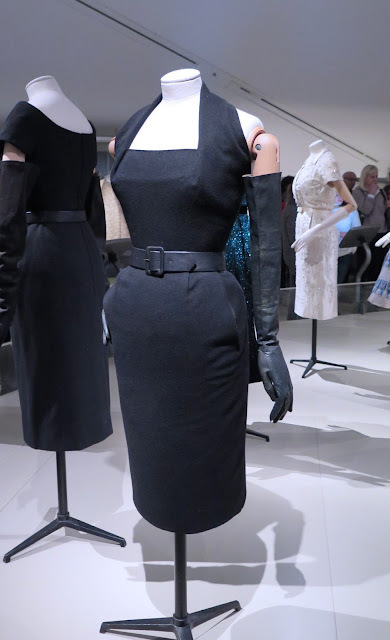 As part of the structure of this "New Look", Dior also revived the art of cut, shaped, and boned corsetry, which raised the bust, flattened the stomach, and accentuated the waist and hips. The Caracas late afternoon dress (above, and in black worn by Sophia Loren) is a perfect example of the extreme feminine shape of the "New Look". The neckline was very flattering, revealing the shoulders and decollete, and the lines draw the eye upwards to the wearer's face. The corseted waist and extremely full skirt creates an hourglass figure. The "New Look" shape demanded a great deal from the wearer - the dresses contained miles of fabric, making them heavy, and the interior corsetry made it difficult to breath. 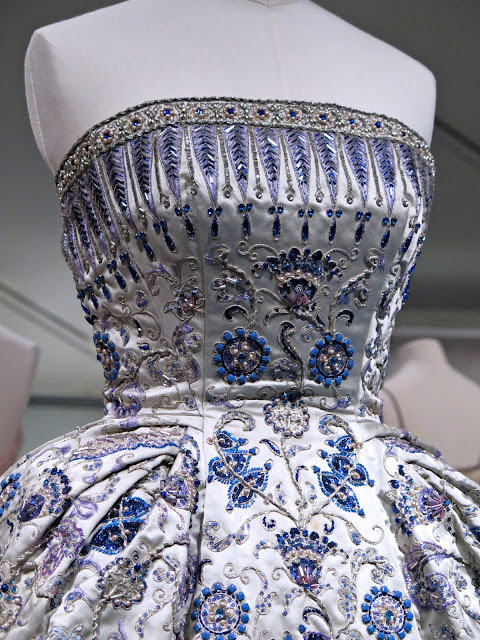 While not a fan of the extreme shape, I do appreciate the exquisite details that Dior incorporated into his designs - embroidery, beading, draping, and architectural necklines. The exhibit fills one large room, with dresses displayed on mannequins on two central islands, with accessories, notebooks and fabric samples in glass cases along the walls. The 38 dresses on display are from the ROM's own archives, and were donated to the museum by Toronto and Montreal socialites. Dior's interest in architecture can be seen in necklines such as the one on this two piece day dress from 1950. I was fascinated by the complex design of this suit jacket, from 1949, which has a second front panel that forms the large breast pockets with the extremely high pocket flaps. 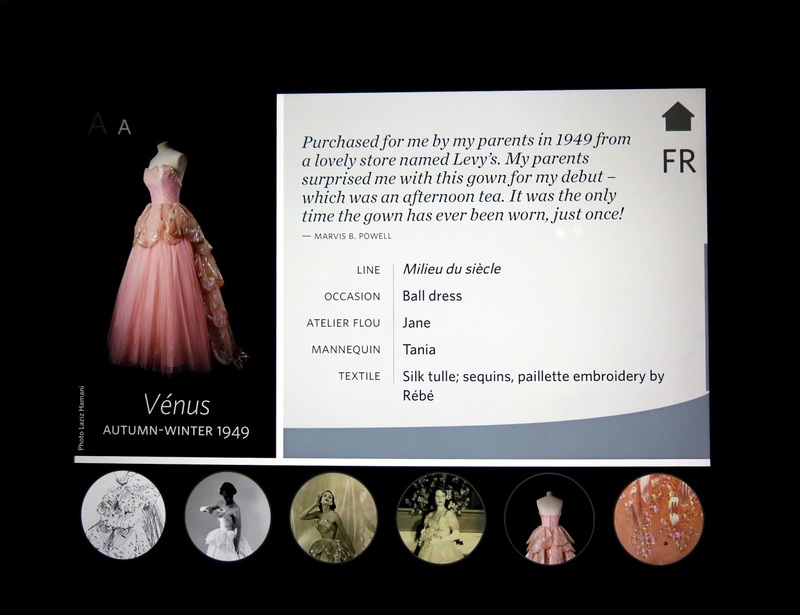 The dresses were vintage, but the ROM makes use of modern technology in the exhibit by providing touch screens mounted on stands that provide details about the dresses, including name (Dior named his dresses), fabric, year, original fitting model, construction details, as well as quotes and photos of the original owner if available. Details for the frothy, fairy princess ball gown, Vénus, which was purchased for Marvis B. Powell's debut in 1949. The dress itself, embroidered with 10 different beads and sequins, including iridescent "feather" sequins. I thought it was such a shame that this gorgeous creation was worn only once. 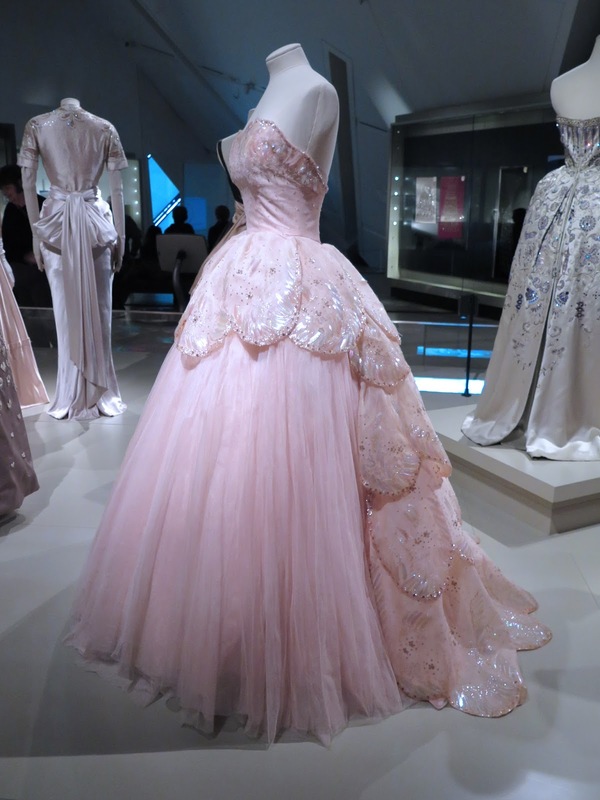 Not all of Dior's dresses had full skirts. 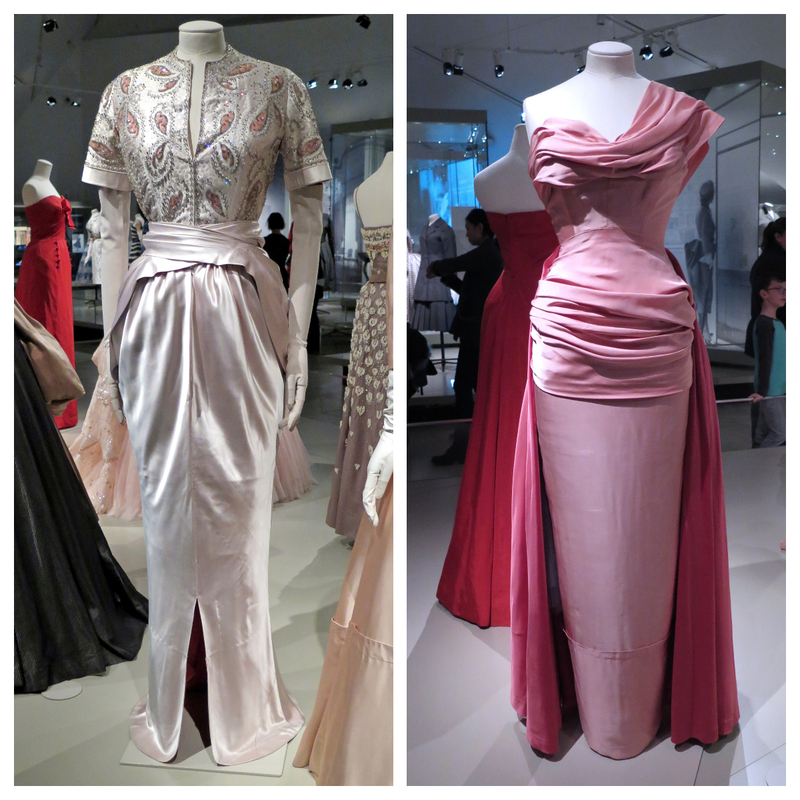 The two designs above - Saadi on the left, and Rose France on the right, both from 1947 - show how the choice of fabric, embellishment and exquisite draping could result in something just as flattering and feminine as a full-skirted ballgown. My favourite pieces in the show were a pair of exquisite evening jackets. 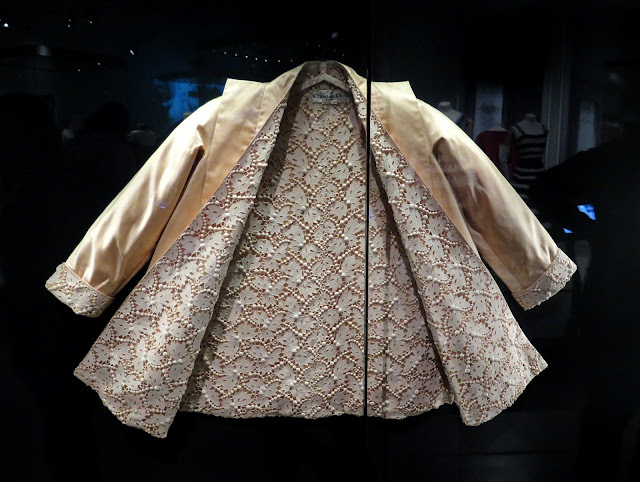 The one above, from 1948, was purchased in Toronto and worn by socialite Lillian Weiss. 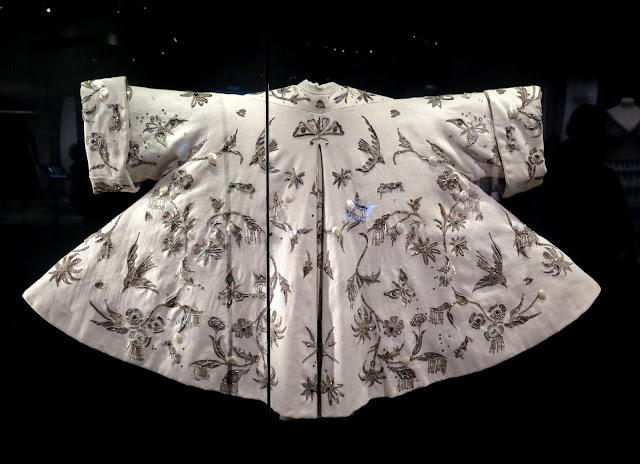 The embroidery includes 8 kinds of gilt and silver thread, and 12 varieties of mother-of-pearl and silvered beads, coloured stones, crystals, and sequins. 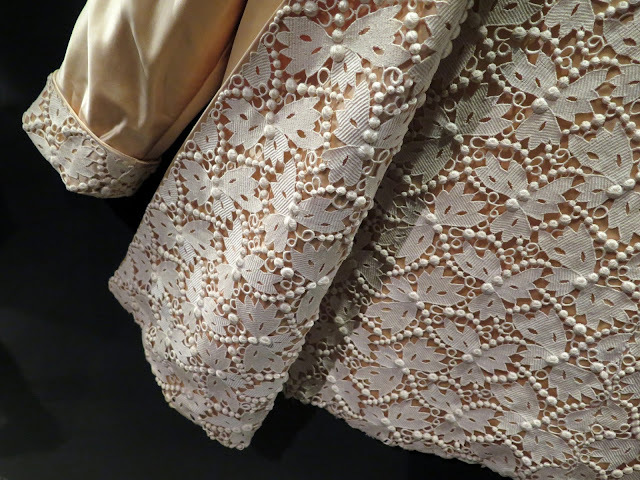 The second jacket, named Tour Eiffel, from Spring 1949, is made of silk satin lined with cotton lace. The fabulous three dimensional effect in the lining was created by the highly skilled women who worked at Maison Rébé, owned by René Bégué. The house embroidered haute couture fashions and accessories for many design houses. The other source for the hand embroidery on Dior's designs was Maison Hurel. 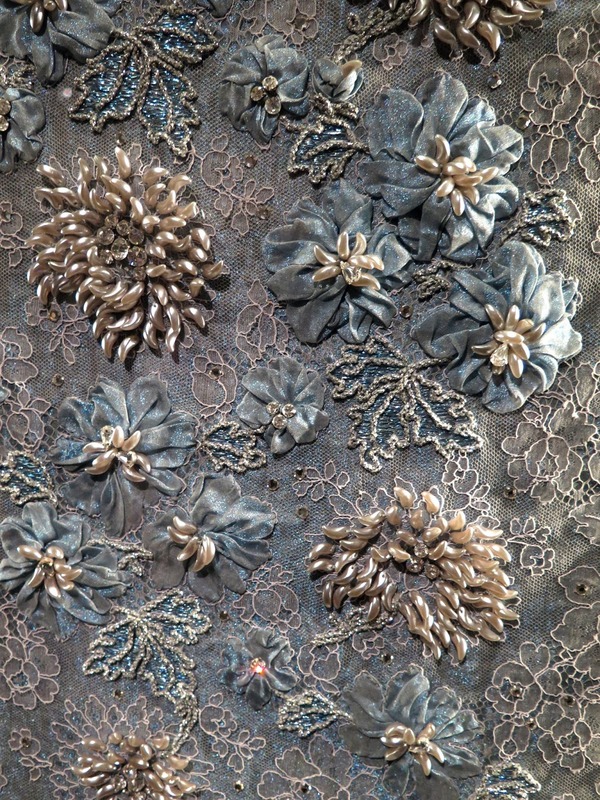 Above is an embroidery sample for a floral evening dress from 1950 featuring Chantilly lace, pearlized beads, Swarovski crystals and applied silk floral petals. The exhibit included notebooks and registers of fabrics and embellishments used in Dior's designs. The book above recorded the information for setting up the loom to make velvet ribbons for the company Giron Frères. 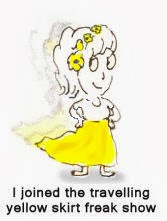 By the 19th century the art of designing and weaving ribbons was centred in France. Staron was an established and important French luxury textile manufacturing firm, and a key supplier of textiles to the House of Dior. 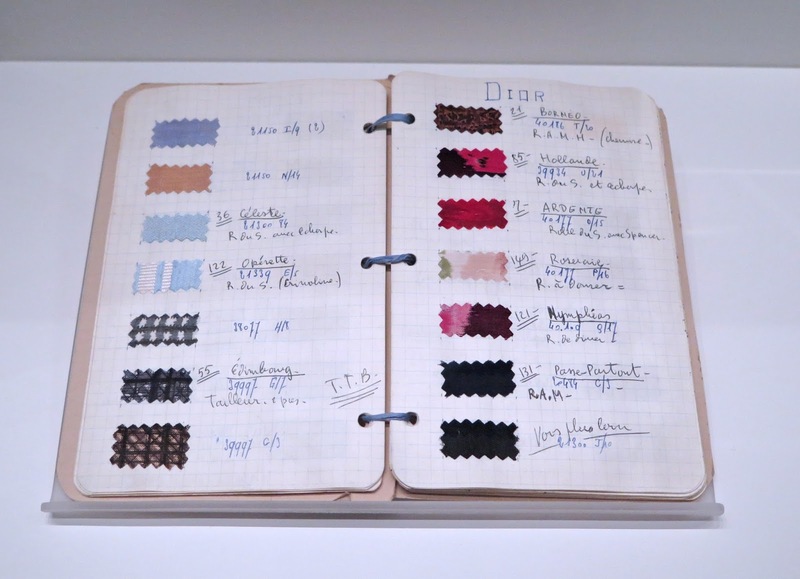 The notebook above belonged to Claude Staron, and listed all of his textiles that were used in Dior's Spring-Summer 1957 collection. 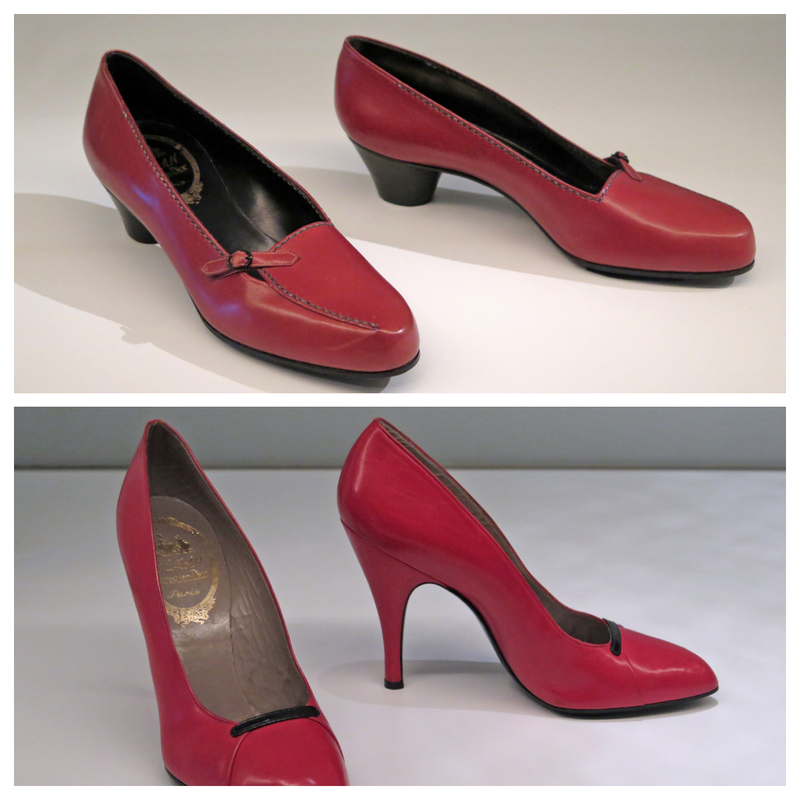 The exhibit featured some of the shoes that Roger Vivier had designed for Dior. The pair at the top are a "morning shoe" featuring a new rounded heel, while the ones on the bottom are an "afternoon shoe". The description noted that "Dior preferred practical low heels for morning and taller ones as the day progressed and became more formal". Somehow I don't think that Dior would have approved of my "Doc Martens for any time of day" philosophy. The lily of the valley was Christian Dior's lucky flower and he always kept a sprig with him. 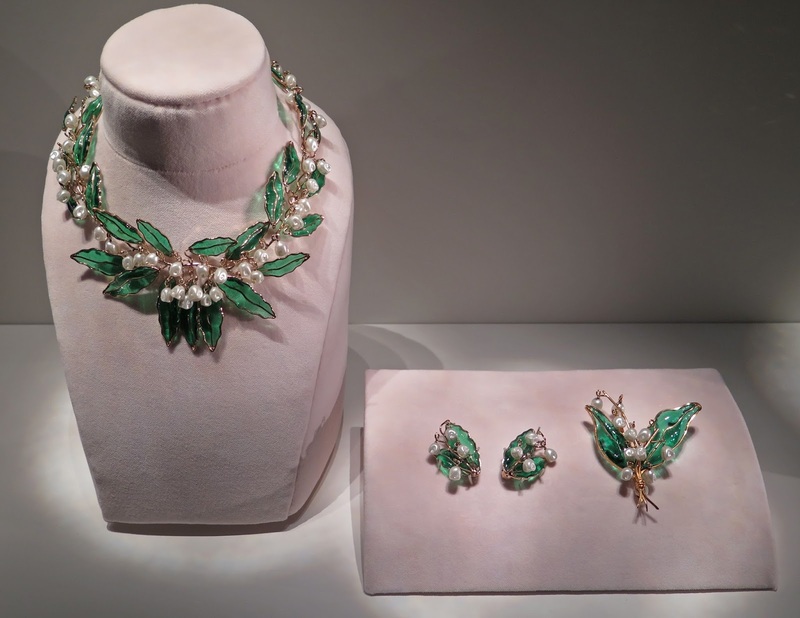 The flower featured heavily in his perfumes, and was also the theme for the set of costume jewellery above, made by Maison Gripoix in 1950, and on loan from Toronto collector and dealer Carol Tanenbaum. 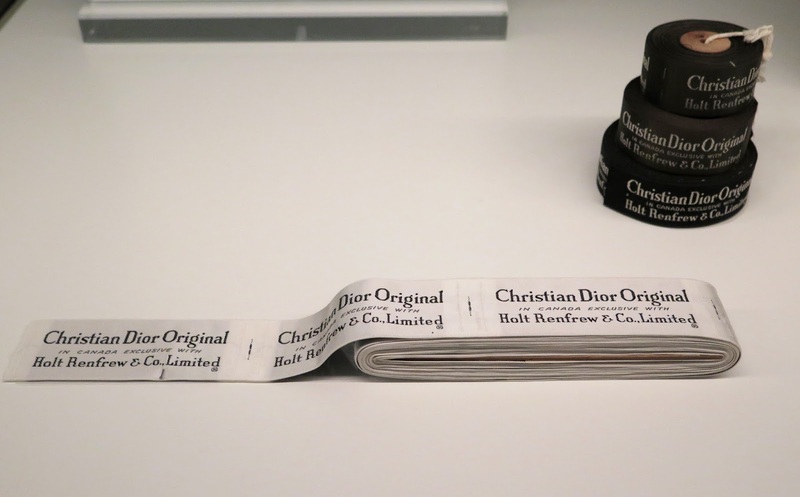 In 1951, the President of Holt Renfrew secured the exclusive Canadian rights to sell Christian Dior haute couture in the eight Holt Renfrew stores around the country. To reinforce this agreement, the store sewed a special label into the garments that linked the two companies together. Christian Dior died in Italy in 1957, at the age of 52. At the time of his death, his house was earning upwards of 20 million dollars annually. 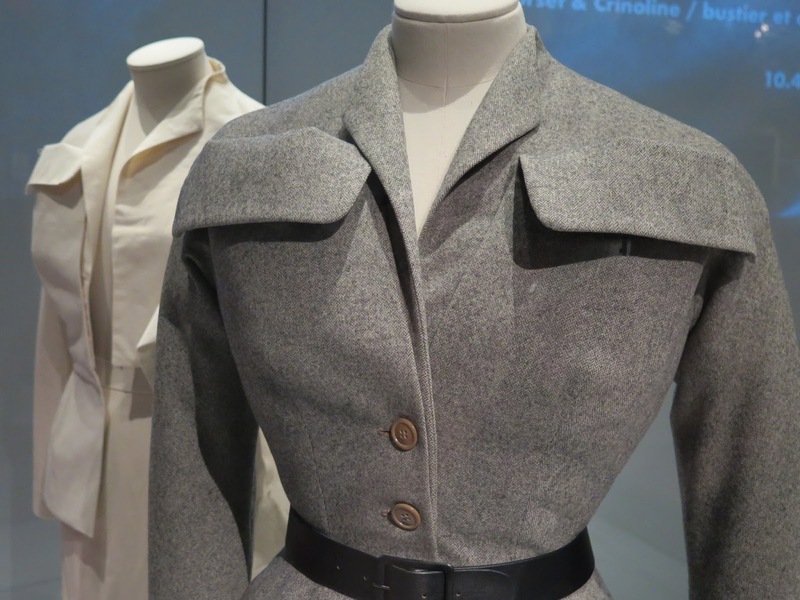 His bold, post-war designs revolutionized the fashion industry and the House of Dior continues to be an influential design house in Paris today. 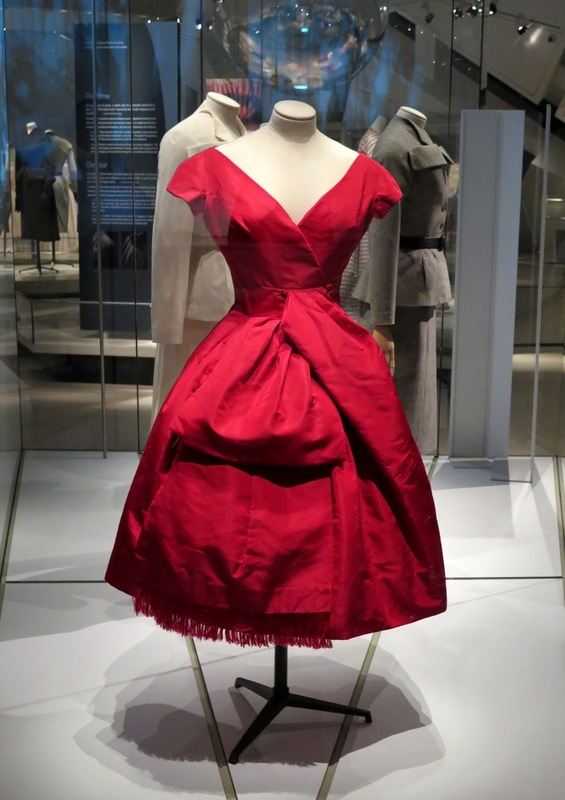 If you are interested in reading more about Dior and his designs, the exhibit's curator, Alexandra Palmer, has written a book, Christian Dior: History & Modernity, 1947 - 1957, which will be published later this year. 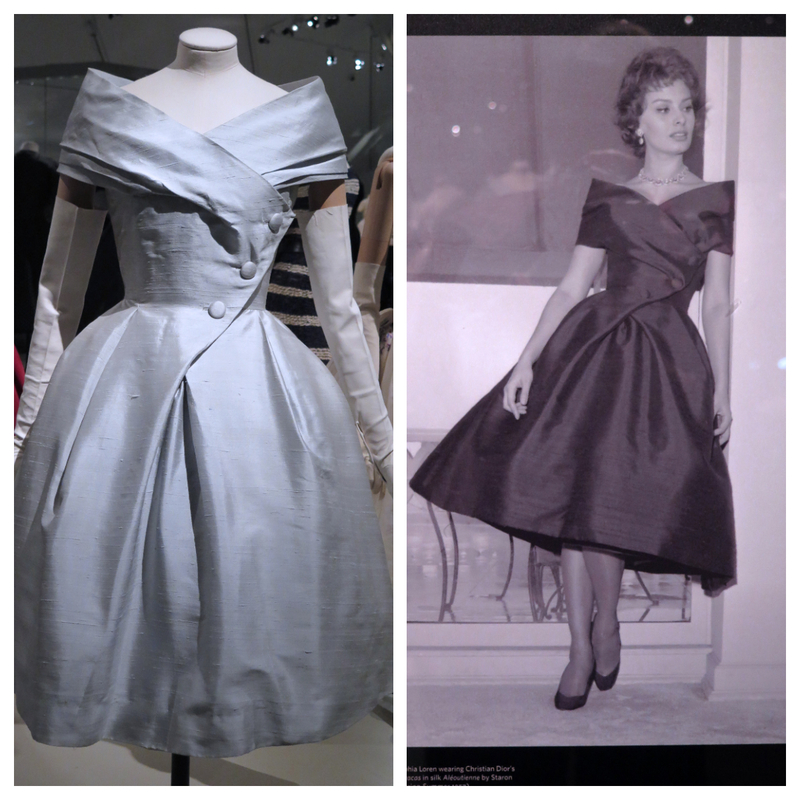 Christian Dior continues at the ROM until March 18th. woww, so fabulous exhibition, I would enjoy it enthusiastically!, all those dresses, the embroideries, the rich textures, the luxurious fabrics! 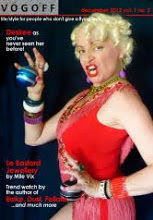 I'm also in love with those evening jackets, and the fabulous necklace!. I'm glad you finally made it to the exhibit! I really found it interesting that he tried to support artisans that were losing their businesses. Feels like it has been a constant struggle to keep artisans employed doing what they do best and keeping certain industries alive. The pleats on the Palmyre's skirt are fascinating! Thanks for the great write-up. Wonderful post. Lucky you for seeing it and lucky us that you gave us a beautiful glimpse.